Creative Fox: I have nothing to wear! Asked to a Christmas party? Really excited? What are you going to where? If ,like me, you have the consistent dilemma of the " scattering wide and many" approach to choose said outfit you would recognise this little lady. She too has come to the conclusion that the only dress that isn't too breasty, has a 'not dangling hem', wasn't worn to death last year, well it doesn't tick her sparkly category! Short of fashioning your own from the downstairs curtains and gaffa tape you will have to do the mercy dash round similarly shaped friends and don't eat, drink or be spilled upon!
" I'm not going! 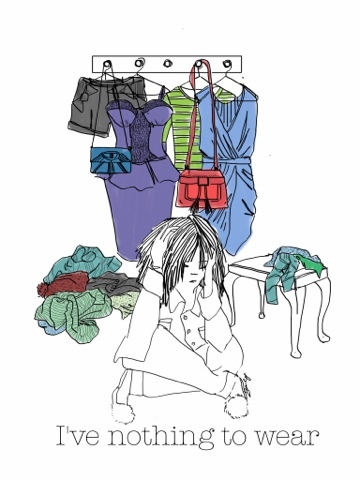 I've nothing to wear"